While the NFL’s contenders still push all of their efforts into 2018 and a Super Bowl appearance in February, the league’s one-win and two-win teams (among some others) are already starting to look at free agency in March. As such, we’ve highlighted some of the best players on the defensive side of the ball who are slated to have their contracts expire at the end of the 2018 season. Brandon Graham is one of the elite edge defenders in the game, and he has Super Bowl experience under his belt. Currently, he has an overall grade of 90.3, ranking first among edge defenders. He has produced 42 total pressures (33 hurries, five hits, four sacks) on 280 pass-rush snaps, good for a pass-rush productivity rating of 8.4, tied for 13th among edge defenders. Although he is known mostly for his pass-rushing prowess, Graham has quietly been among the elite run-stoppers at the edge position this season; he has 14 run stops on 103 run defense snaps, ranking fifth in run stop percentage (13.6%) at his position. Whether he stays or goes, he will be a force in the trenches for his team. In his fourth year out of Arkansas, Trey Flowers is in the midst of his best season as a pro. He is tied for third among edge defenders with an overall grade of 89.9. Flowers does most of his damage against the run, with 18 run stops on 145 run defense snaps, good for the eighth-best run stop percentage (12.4%) among edge defenders. Flowers couldn’t have picked a better time to blossom, as he’s only 25 years old and has consistently increased his overall grade from year-to-year. 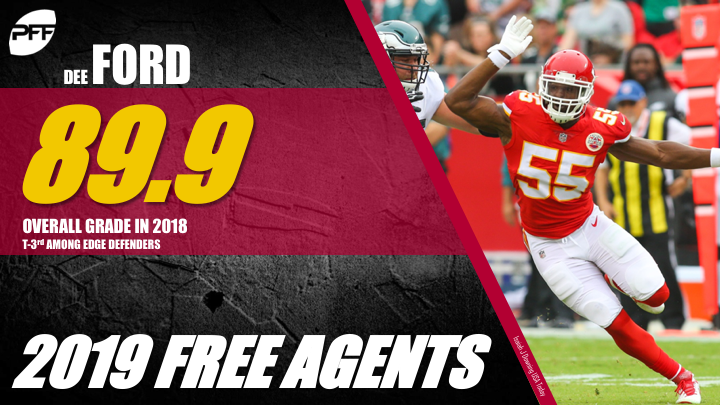 Dee Ford is yet another pass-rushing monster who will hit free agency next offseason. His 54 total pressures (31 hurries, 13 hits, 10 sacks) lead all edge defenders, and his pass-rushing productivity rating (10.4) ranks fourth. Ford has made a gigantic improvement from last season, going from a 59.4 overall grade in 2017 to an 89.9 overall grade this year. This year also marks the first time that Ford has had an overall grade over 65.0. Ford broke through at just the right time, and he’ll likely demand some big money. In his third year, Michael Pierce has emerged as an elite interior defender. Although he has played only 188 snaps this season, Pierce has shown what he’s capable of in his relatively small sample size. He wreaks havoc against the run, as shown by his 90.2 run defense grade, ranking sixth among interior defenders. There are quite a few teams that are getting gashed by the run this season and Michael Pierce can help with that. Kareem Jackson has aged like fine wine. Approaching 31 years old, Jackson is having by far his best season in the NFL. He currently has an overall grade of 90.1, which is ranked first among cornerbacks (and the only one above 90.0). 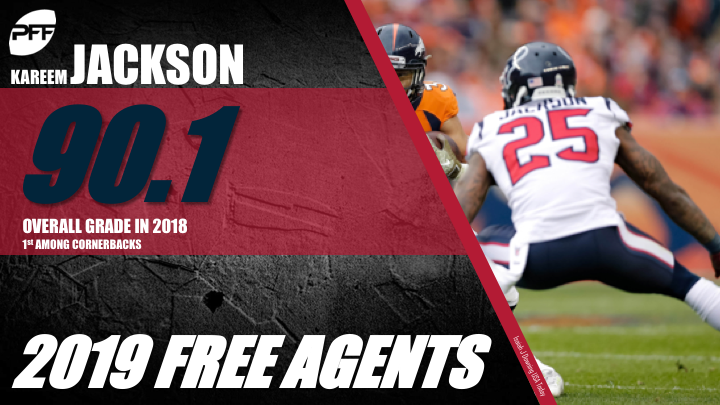 Jackson is great in coverage, as he has allowed an average of 0.84 yards per cover snap, ranking 16th out of 121 cornerbacks. Bryce Callahan is one of the key pieces to Chicago’s league-best defense. He currently has an overall grade of 88.2, ranking third among cornerbacks. His overall grade has jumped by more than 10 points for two straight seasons now, going from 62.9 in 2016 to 77.7 in 2017 and now all the way up to 88.2. Callahan has allowed an average of 0.66 yards per coverage snap this season, ranking sixth among cornerbacks. He’s one spot ahead of Casey Hayward Jr. and one spot behind Chris Harris Jr., making him part of some elite company. The Bears would be wise to give him what he wants and keep their great defense together. 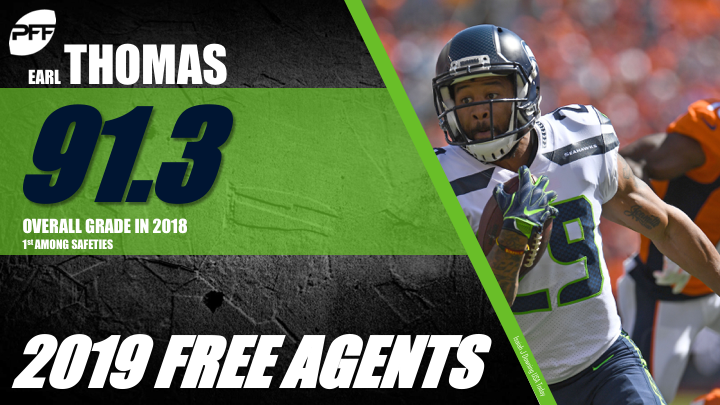 Earl Thomas held out to start the offseason in hopes of a contract extension, but he gave in and played anyway. He was the league’s highest-graded safety (91.3) when he suffered a season-ending injury in week four. Due to the bitter way in which his season ended -broken leg with no contract extension- he is most likely going to go elsewhere. Whoever gets him will be getting a safety who finished last season with the fifth-best overall grade (90.2) among safeties. Thomas is still an elite defender and can be the final piece for teams with Super Bowl hopes.